This is a military town and a high cost area, but our rich World War II history makes it an interesting assignment. 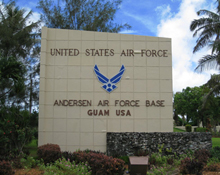 Andersen Air Force Base, Guam is located on the north end of Guam, approximately 15 miles from the capital, Agana. Andersen AFB is in the village of Yigo. There are plenty of recreational and travel opportunities which make Andersen a popular tour among the adventurous. Guam is the most southern island in the Marianas Island chain.